Note: Google Books Advanced Search is dependent on your Browser for what interface it presents - for the full searchable date format use only the current browser versions (not IE 9 or earlier). The above logos and trademarks are the property of the respective organisations identified and links are provided here as a courtesy to site users. No endorsement of www.william-kennish.com should be implied or assumed by this service. 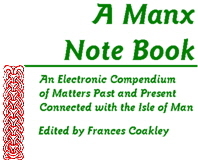 However this site does endorse and recommend the above resources as exceptional contributors to the promotion of Manx History. If you are keen to investigate further details of the career of William Kennish or are interested in Naval Gunnery, the exploration of the Panama and New Grenada regions of South America, you might find these links to archives scanned by the Google Books project useful. 1. Manx Christmas carol singing as described by William in Mona's Isle under the title “Ilvary” - as recounted in the pages of the Proceedings of the Manx Society, Vol XVI 1869 on page 157. 2. The full report published by Frederick Kelly of William’s survey of the Atrato Region “A Ship Canal to connect the Atlantic and Pacific Oceans...” published in 1855. 3. A subsequent version of the report by Frederick Kelly, describing William’s investigations, entitled “The Union of the Oceans by Ship Canal without Locks via the Atrato Valley.” published in 1859. 6. The Proceedings of the Royal Geographical Society, London 1856. XIV.— Explorations through the Valley of the Atrato to the Pacific, in Search of a Route for a Ship Canal., by direction of F. M. Kelley, Esq., of New York. ,Communicated by the Secretary. Read, April 28, 1856. 7. The French language version of Frederick Kelley report including Baron Von Humboldt’s letter praising William Kennish. 8. Princeton University appear to hold the copy of Concentrating a Broadside... originally given to William Kennish by the UK publisher, as the handwritten note on the inside cover states “the publication of your book” and further on “Bureau of Ordnance and Hydrography” indicating it may have been donated by William to the Bureau when he demonstrated his diving device in Brooklyn Harbour in 1850. Note that regrettably, Google scanning staff did not bother to unfold any maps or plans in any of the books scanned as part of this wider project, and so sadly they have been lost from this on-line resource. Originals of all these papers exist in the Library of Congress, USA and at the British Library London, plus the archives of the Institution of Civil Engineers and the Royal Geographical Society both in London and both not open to the public. This list will be developed and added to as the resources are identified.